The popularity of the Harry Potter books and films has helped boost visitor numbers to Oxford's Christ Church Cathedral. The 16th Century cathedral and college complex was used as the backdrop for several scenes in the popular film series. With fans of the teenage wizard flocking to see film locations, visitor numbers at the cathedral have risen to 350,000 a year. Very Reverend Christopher Lewis, Dean of Christ Church Cathedral, said: "People know some of the films are based and shot here and that's a big factor, particularly for a certain age group." The cathedral, which dates from the 12th Century, is different to others in being an integral part of an educational establishment - Christ Church College. Henry VIII founded the university college and cathedral institution in 1546 and Sir Christopher Wren was commissioned to design the famous bell tower in 1682. Four centuries later, the historical surroundings were seen by millions watching the Harry Potter films. The staircase which leads up to the Great Hall was used for the arrival scene for new Hogwarts students in the first two Harry Potter films. Mr Lewis said: "Its a very beautiful staircase - like many others - but of course it has the Harry Potter factor." The Great Hall itself was replicated at film studios as the grand dining hall at Hogwarts school. 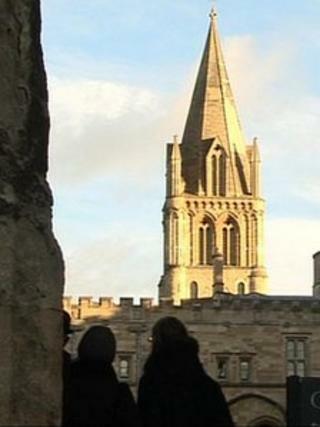 Tourists now pay to go on a tourist trail which takes in both the college and cathedral. Mr Lewis said tourist numbers had been "steadily rising" with numbers up to 350,000, compared to 300,000 annually, three years ago. "There's more groups, more Chinese and eastern Europeans, but also from all over the world. "Our visitors tend to be younger than for other cathedrals, more men and perhaps they are less familiar with what a cathedral is all about. "I take the view it is an opportunity for them to light a candle, say a prayer and be in a quiet holy place." The numbers inevitably put pressure on the building, its facilities and the adjoining college. Admission fees are set at £7 for adults, £5.50 for concessions, rising in the summer, in a bid to control visitor numbers. Mr Lewis said: "Sometimes it gets bit much in the middle of the summer. "Visitor charges are partly to keep the flow of visitors appropriate for the place - it's an educational establishment and we need to keep it quiet. "We do make money from it which goes to the upkeep of the buildings and running the institution." He admits part of the success is down to simply being in Oxford. "Oxford is an international destination, but there are not many places in Oxford to actually go into - it's an experience you can tell people about, different to just walking around the streets looking at things. "The two elements with Christ Church do complement each other - the very beautiful college and the ancient cathedral," he said.